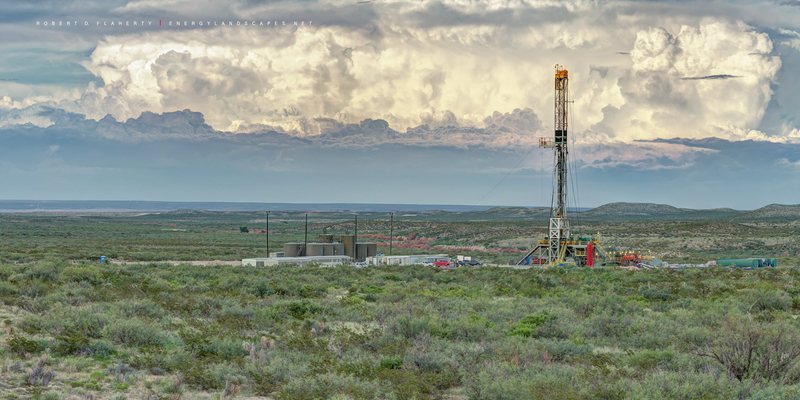 In Storm At Middle Ground Cactus Rocket Rig 148 can be seen drilling a lateral gas well in the mountains of far Western Texas. A severe thunderstorm on the Texas and New Mexico border forms the backdrop for the image. The photograph is a composite 2:1 panoramic image created using sixty three 50 megapixel images. The process makes for a very detailed image and contributes to the three dimensional feel people notice in my work. Fine Art Oil & Gas Photography By Robert D. Flaherty. Photo © copyright by Robert D. Flaherty.